If you’ve wondered how to grow onions with so many different types out there, stay tuned. Hopefully, this will help you sort it out. Storage onions, green onions, or chives, this is the question. 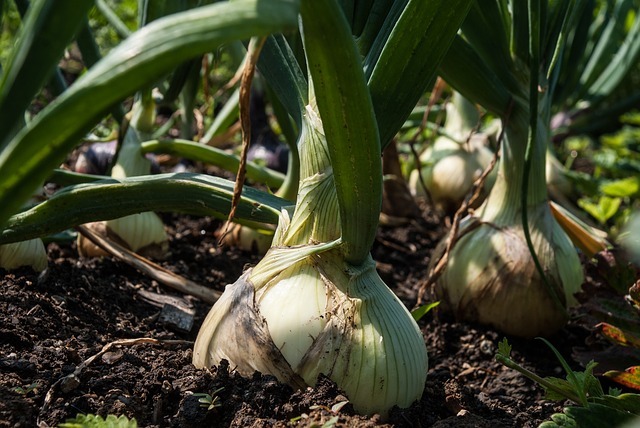 If you have a huge garden, having a few rows of onions will most likely not be a problem. 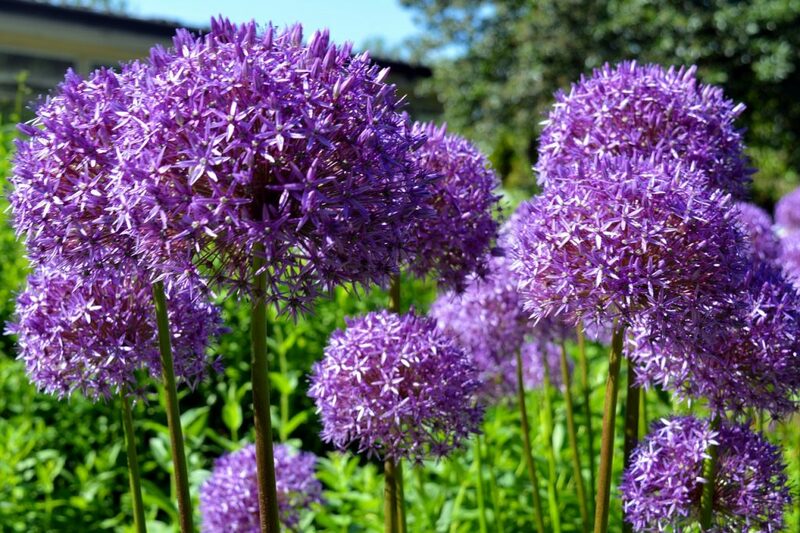 But if you are working within pocket-size garden constraints or in pots, full-sized onions may not be for you. For starters, there are few large onion types that rarely take less than 90 to 100 days to reach maturity. Once you thin the seedlings out to a proper spacing of six inches apart, or so, growing enough onions for off-season use can be an issue. Then, of course, you need room to store them. 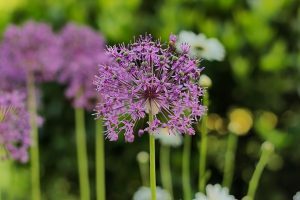 Onions fall into the allium family and have unique and beautiful blooms for your landscape. However, for the purposes of this post, we are talking about the edible ending of our efforts. Whatever type of onions you choose, there are certain growing requirements. As with many root vegetables, somewhat sandy but well-amended soil with a ph of 6.5 to 7.0 is ideal. This means digging in, compost and/or composted manure for the nutrients they need. Having good, healthy soil is essential to growing any crop. I’ll be sure to cover the basics in another blog post, but for here the big to-do is digging in compost and making sure your pH is between 6.5 to 7. 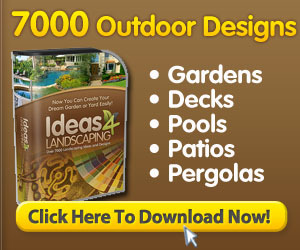 A simple kit from your local garden center will help you out with this. 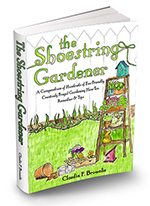 The Shoestring Gardener, the book for every frugal gardener. After all, we all like good results. Smashing results, if we can get it! Who doesn’t have dreams of fabulous meals with home-fresh ingredients? Now back to onions in general. The choice of what you grow is going to depend on the space and time available to you. Here are some small-space onion options. Chives are the perennial version of green onions, and once established, will come back year after year. The clumps will slowly keep spreading, and every two to three years, need to be divided up. You can give the extra clumps away to friends and family. They will grow in pots on window sills, or back garden nooks. To put it simply, chives are the onion of easiest adaptability, from peasants to kings. They can be a little slow to get growing if you start from seed, meaning that it takes a while for them to start spreading and sending up more shoots. By the second year you can start harvesting the long slender leaves and using them as you wish in cooking. But spread they will, slowly and surely. 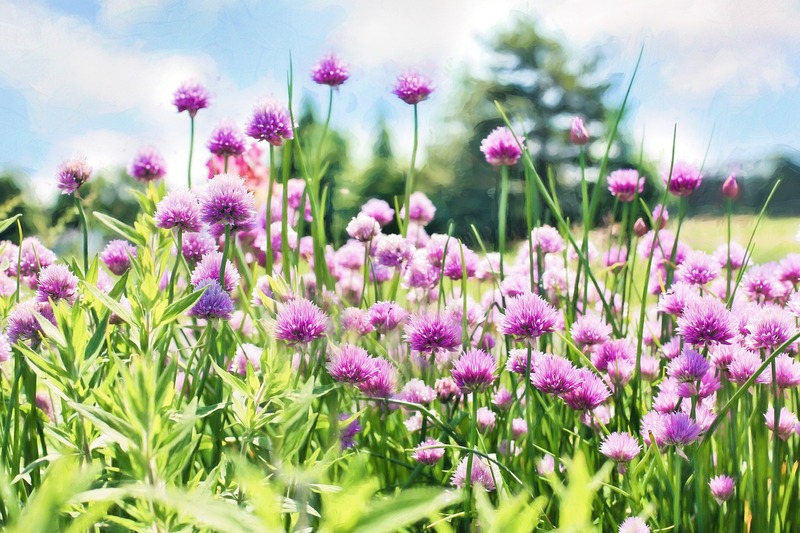 In fact, I’m sure that is how most people I know have ended up with chives, is when their neighbors or family members are dividing their clump of chives every two to three years, and give away the excess bounty. If you can find someone giving away clumps of chives, by all means take it, it will put you a year ahead on harvesting and eating. 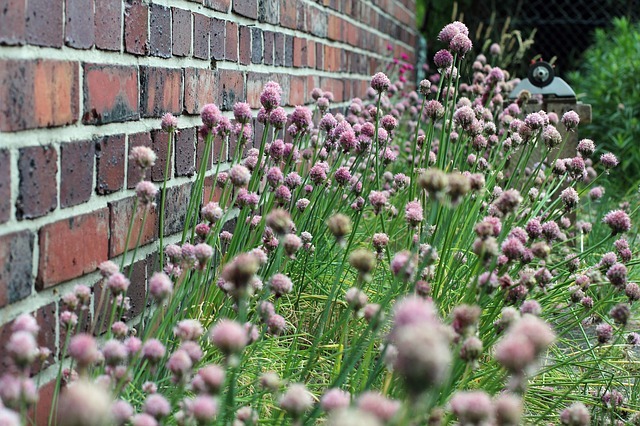 Once established, chives will grow in just about every zone. I have seen them growing up in the Yukon Territory year after year in zone 2-3, in a sheltered spot. They like a nice sunny spot when growing, and well-drained soil. Beyond that, they don’t want much. If you can give them a little compost in the spring and fall, they will do very well. Once you get to the point that you can harvest handfuls every few days, you can cut them up and lay them out to dry on a cookie sheet in a low-heat oven for an hour (just enough heat to make it warm), or use a food dehydrator. Store in a dry, air-tight container in a cool dark place for winter use. Use as garnishes for meals, additions to salads, or sprinkling into soups at the last minute for extra flavor. Green onions are usually in great demand from any garden. Depending on the type you get, they generally take 40-60 days for maturity. And they are well worth the wait. The really awesome part is that you can grow them in containers too. Plant seeds in well-drained soil with a goodly amount of compost raked in. I like to plant the seeds a quarter inch apart. When they are sprouted and 3-4 inches tall, thin them out to half an inch apart and use the baby shoots for eating. They are so tender at this stage. Then, as they get about 6-8 inches tall, I thin them again to about 1 inch apart. From there on, I pick as needed. They can get very large with regular watering but are not so tender as younger shoots. 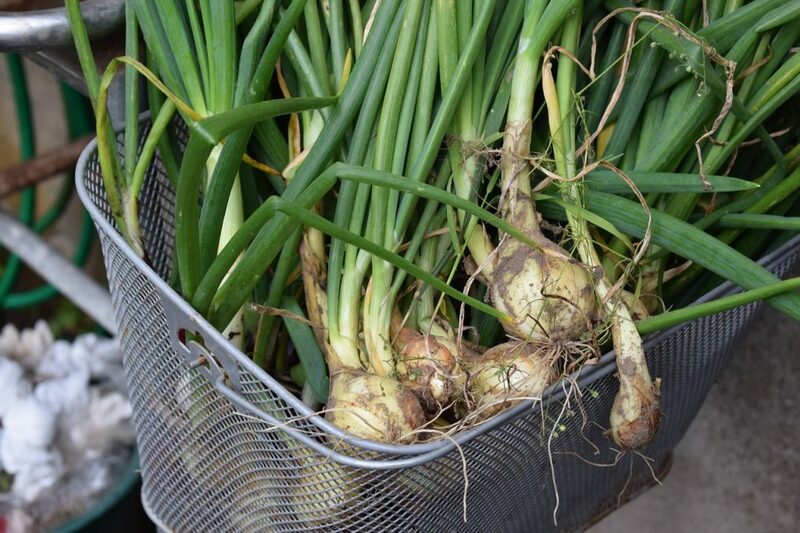 Planting tip: If you plant a short row of green onions about every two weeks, once the soil is warm enough, you will have a continuous supply throughout the season. A little-known fact: if you snip off a couple of the green leaves at a time, they will grow back quickly, supplying you with a regular supply of spring onion greens. In fact, if you leave them in the ground, they will often come back spring after spring as soon as the ground warms up. I had a couple I experimented with for three years here, coming back each spring. This year, they did not make it back, which is a pretty good run, I think, for a vegetable that most people use in succession plantings. Regular onions, winter onions, storage onions. If you are going to grow them, require their own space, small field, or raised bed. They are a full season crop, requiring anywhere from 90 – 120 days depending on the type of seed. If you are bound and determined to grow onions, in a small space, no matter what, my suggestion is to look into a form of vertical gardening. There are a lot of plans and ideas out there, and I’m sure one can be adapted for the space it takes for onions bulbs to develop. Onions like quite sandy soil with compost. While some moisture is necessary, they tend to like being a little dryer and not having wet feet, at least in my experience. But, because their roots systems tend to be shallow, you don’t want more than the top inch of soil drying out either. Mulching is definitely a benefit here as it helps retain the moisture content as well as soil temperature. It certainly is nice to have your own onions through the winter to put into stews and casseroles, and there is nothing like slicing up a big Wala Wala Sweet Onion for sandwiches and burgers. 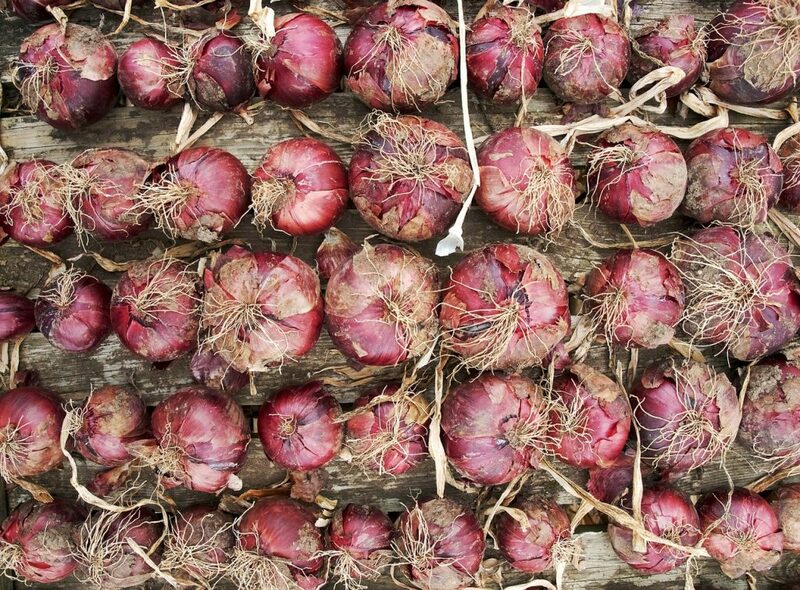 Whatever it is you use them for, if you are storing through the winter, get onions that are termed winter or storage onions. 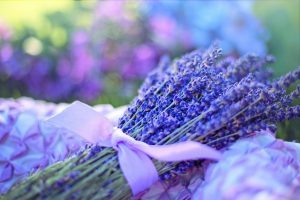 In the fall, when the tops start turning brown and papery, pull them up, gently shake the excess dirt off, and put them in an airy, dry place to cure for a while. This means that the tops completely dry out and the outer layers of the onion are papery and dry. If you live in a climate where you can leave them lying out in the field or garden for a few days for the sun to cure, that is great. If you live in a wet, damp climate, you will need to lay them out in a garage or shed where there is some warmth and circulation to dry. Once the tops are completely brown and dry, right down to the stem, you can cut the tops off, and store in a cool dry place. Or, if you wish a little old-fashioned beauty in your kitchen or pantry, braid them together and hang out of the way. Happy onion growing, and please share this with all your gardening friends!